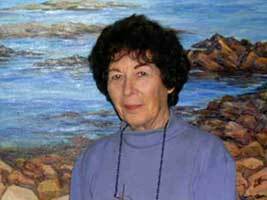 Margaret Florence Ludwig was born in 1928 in Peterborough, Ontario. She is a graduate of the Ontario College of Art (1951). Studies include the Artist's Workshop, Central Technical School, The Toronto School of Art and York University. She taught sculpture at the Artist's Workshop (1977-1979). Good standing member of the Haliconian Club, the Arts and Letters and the Portrait Society of Canada. 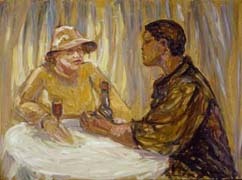 A change in her work and attitude developed when she began to appreciate the quiet and solitude of landscape painting. Snow, wind, ice and searing sun are the elements that transform nature, as she sees it, into vibrant and exciting paintings. Baffin Island, Newfoundland, the Queen Charlotte Islands, Greenland and Mexico are the sources of many of her works. Burleigh falls being her favorite source of inspiration in Ontario. Her latest canvasses depict the majesty and awe of the North Arctic and Antarctic, in her recent trips to these exciting places. She has a great numer of solo and group exhibitions. The artist's work is in many private and corporate collections in Canada, U.S. and England.